WAIST HIGH: "History Is The Great Equalizer." "History Is The Great Equalizer." Say hello to The 80s Underground, a brand new blog from the host of The 80s Underground, "a weekly radio show that resurrects the best in 80's indie, college, punk, post-punk, new wave, and modern rock." The show broadcasts every Wednesday morning from 9-11 on 103.3 fm in Santa Clara, CA, and online at kscu.org. The truth he speaks: "One of the great things about music (especially for over-the-hill geezers like myself) is its profound ability to etch a detailed history in one's memory banks: the time, place, sights and smells...maybe even the state of mind you had when you heard some great song album, or some great movement that changed the way you felt about music forever. "For me it was discovering a radio station in 1982 that, after years of being seeded in bloated corporate rock of the 70's, began anew with a fledgling new format called 'modern rock.' While that station (KROQ) still owes its existence to the corporate behemoth, it was single-handedly responsible for bringing a slew of incredible new sounds to geeky, potch-faced suburbanites like myself who desperately wanted more out of music than Journey, REO Speedwagon and Van Halen could ever hope to offer. 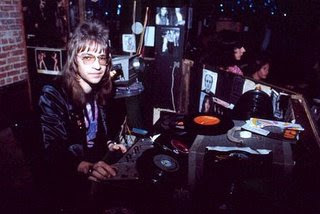 "Of course, a huge debt of gratitude is owed to Rodney Bingenheimer, the Godfather of the LA Punk/Underground scene and still a current staple at KROQ. It was Sir Rodney who first brought those sounds to the airwaves, as far back as 1979, when he was brazen enough to play the first Germs record on commercial radio!"